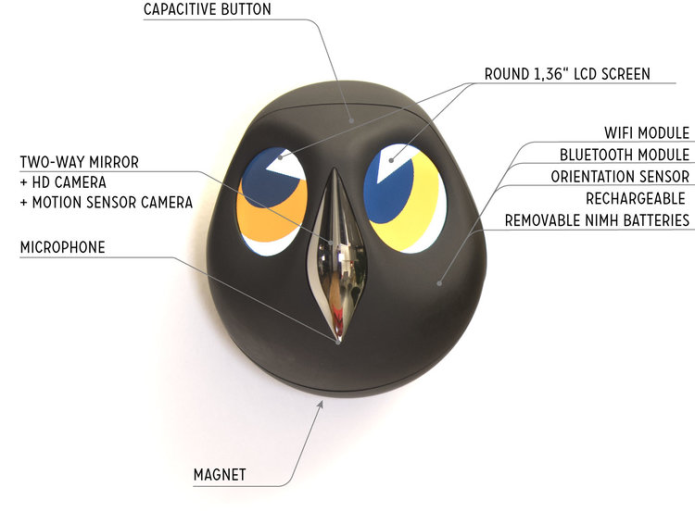 An interactive home monitoring owl. Today more and more objects are connected, but none of them truly connects with you. Ulo creates a unique bond, like no other device. It redefines the way you interact with objects: an organic communication. Evidence shows that a number of facial expressions are related to similar emotions across cultures. The language of our eyes is one of the most powerful and effective tools of non-verbal communication. Eye expressions are an efficient, natural and universal way to connect instantly with Ulo. Ulo services are accessible on a secure webpage and dedicated mobile apps for iOS & Android, so it is compatible with every device with a web browser. Ulo communicates through eye expressions. A webpage and mobile apps allows you to customize eyes color, shape and size to match your interior and your taste. No logos or icons are displayed on the screens, but you instantly know what Ulo has in mind. its eyes follow your movements and Ulo squints when someone is watching live video. Random animations add that extra spark of life which makes Ulo unique. Eye expressions are possible thanks to new round LCD screens originally manufactured for next-generation smartwatches. 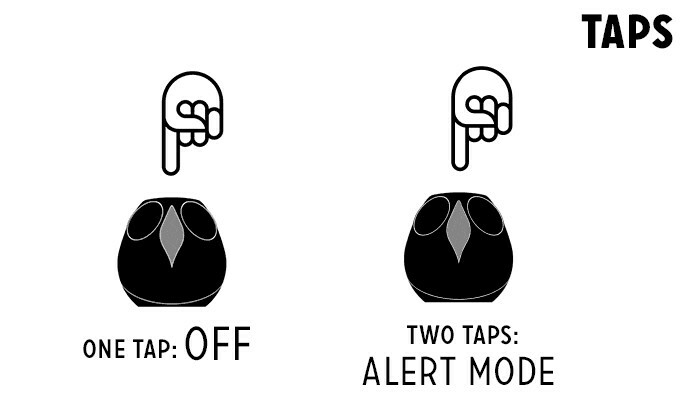 This is an example of the default tap system. You can configure custom (and secret) sequences to trigger On/Off & Alert Mode functions. A double tap on Ulo forehead will activate the Alert Mode. Once your smartphone leaves your wifi network, every movement will be recorded in an animated gif and sent via email. Eye expressions are not displayed. When your smartphone (and thus yourself) reconnects to your wifi network, the alert mode is disengaged. It is a very simple way to check what is going on in another room or when you’re away. Ulo streams directly (video & audio) on a secure webpage or mobile apps. This feature is perfect to use Ulo as a baby cam. Ulo only stores a few minutes of video locally. With Direct Access, think of Ulo as your own personal server, so there are no extra fees. The owl only sends data to your secure devices when needed. Each device has its own password. Ulo is easy to set up, a detailed user guide is included in the box and video tutorials are available on our website. Infrared night vision let Ulo see clearly in total darkness. In everyday use, with eye expressions, Ulo needs to be recharged every 2 days. Of course, you can also leave Ulo plugged in all the time on a USB port. On a full charge, Ulo can last 2 days in Alert Mode and 4 hours in Live-Stream. Ulo works with 3 rechargeable NimH batteries (LR06) minimum 1900 mA. These rechargeable batteries are not provided but can easily be found in any supermarket. You don't need to remove the NimH batteries to recharge them. Only plug Ulo to a power source. Ulo can lay on a flat surface or be hanged on a wall. A set of discrete adhesive neodymium magnet allows you to stick Ulo on every surface effortlessly. Ulo services are accessible on a webpage, so it is compatible with every device with an internet connection and a browser. It is extremely simple to use and only one registration on a cloud server is needed. Then your Ulo will keep in touch with you wherever you go with an easier authentication for the next uses. Cloud Access is compatible with all routers. 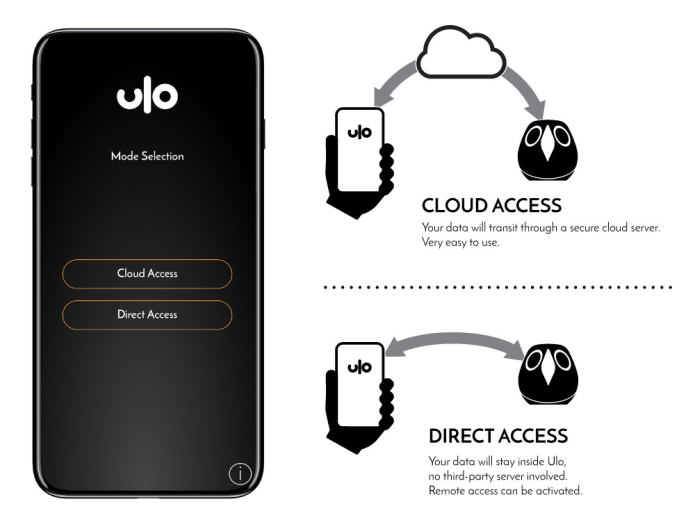 When you are connected on the same Wi-Fi network, Direct Access is the best way to discover the full potential of Ulo. With the new “access from everywhere” option, you are able to see what's going on in your home from the other side of earth or from your favorite supermarket! This configuration needs Universal Plug and Play (UPnP) enabled on your router, most of them can use it. Our refund policy lasts 30 days. If 30 days have gone by since your purchase, unfortunately, we can’t offer you a refund. To complete your return, we require a receipt or proof of purchase. For returns that are not affiliated with warranty cases we will require you to ship the unit back.